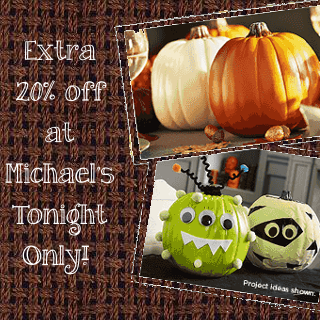 Grab 20% off everything in the store, including sale items, at Michael’s tonight with this coupon. No need to print it out; you can show it on your smartphone or pull it up on the app. Shop online between 4-9 PM tonight and use code 20FALL915 for 20% off your cart. Code SHIP923 will get you free shipping! These adorable 5′ Scarecrows drop to $6.39 with coupon, in store only. 50% off all Fall Decor + Extra 20% with coupon! Fall Wreaths I am in Love With!